What are the ATR 42 and ATR 72 aircraft made by Aérospatiale and Leonardo? The ATR is a twin-engine, turbo-propeller, high wing, regional aircraft which is developed as the result of a joint venture specifically for the purpose of delivering this aircraft. 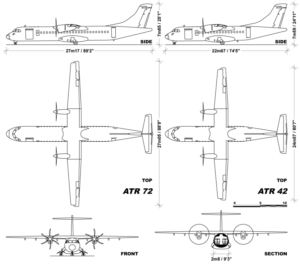 The joint venture between Aérospatiale of France, now known as Airbus, and Aeritalia of Italy, now known as Leonardo was signed on 04 November 1981. Both organisations had identified an opening space in the regional market which had been serviced for quite some time by the then ageing Fokker F-27 Friendship and the Handley-Page Herald. This was a time, in Europe particularly, where aircraft makers were collaborating on ventures which would produce new models, such as the Airbus A300. …..they had both been working on very similar designs…..
Aeritalia and Aérospatiale discovered that they had both been working on very similar designs and therefore it seemed logical to pool their resources and work together. The name of the new venture is Aerei da Trasporto Regionale in Italy or Avions de transport régional in France. The acronym ATR fits both languages nicely. Once the agreement was settled work began to fine-tune the final design, taking the best from designs so far by each party. This plan highlights the differences and similarities between the two ATR varients, the ATR 42 and the larger ATR 72. In standard configuration, the ATR-72 used the rear door(s) to board and deplane passengers. Whilst this is in operation it is normal procedure to secure a tail stand under the tail to prevent the aircraft from tipping backwards whilst the passenger weight is in the rear. The forward door is mainly used for cargo and baggage access and some variants came with smaller or larger door openings depending on the operator’s requirements. In the case of launch customer Finnair, they required the forward door to be used for passenger access and that it fit the air-bridges at Helsinki Airport. Another feature which is unique to the standard ATR offering is the propeller brake on number two engine. Another feature which is unique to the standard ATR offering…….. The reason for this is that whilst on the ground at airfields without ground power, which of course would be more often than not for a regional airliner, the engine can be used as an Auxiliary Power Unit (APU). So by arresting the movement of the propeller, the engine can continue to run, providing power to aircraft for airconditioning and other systems. The initial design was aimed at the 40 seat market and from this the ATR 42 took shape. The 42 refers to the number of seats the aircraft would carry. The first ATR 42 to take flight was known as the model ATR 42-300 and it took to the air for the first time on 16 August 1984. After a rigorous certification process, the ATR 42 received type certification for the French and Italian aviation authorities in September of 1985. 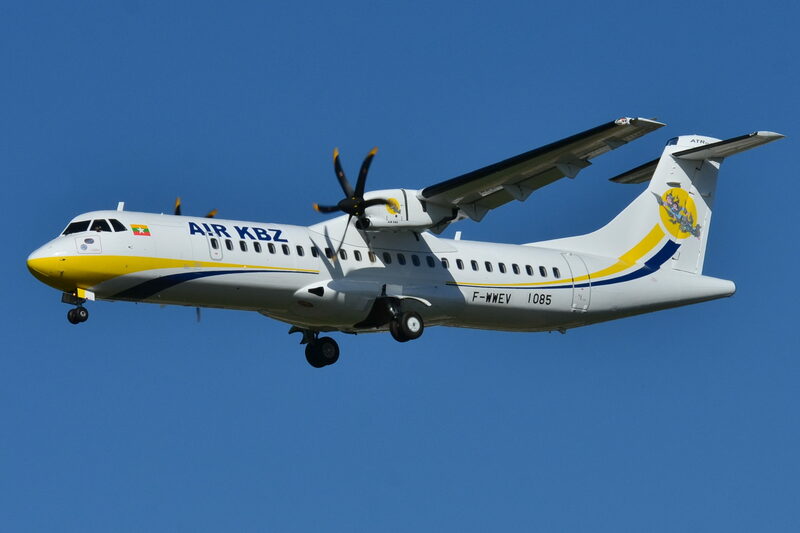 The launch customer, French airline, Air Littoral flew the first commercial flight of the ATR 42 in December of that year. During the time that the ATR 42 was being developed, ATR, the company, was setting up a Customer Services Division which was capable of supporting their aircraft anywhere in the world. This was ready to go by 1983. 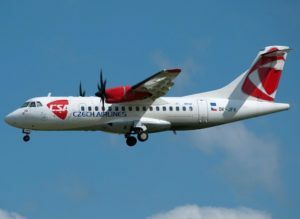 An ATR 42-500 of České Aerolinie. Note the T-tail where the elevators are mounted atop the tail fin. The reason for this is to keep the elevators clear of any disturbed air from the mains wings, particularly during the climb phase. In September 1989 ATR announced that they had achieved their target of 400 sales of the ATR 42. The ATR 42 maintained its original specs until 1996 when some modernising changes were made, one of which was the introduction of the more powerful PW-121 engines which gave it better performance over the original PW-120 engines. The new model was known at the ATR-320 and essentially looked the same as the original ATR-42. Aside from the ATR-300 and 320, there was a further variant to this model which was the ATR-300QC. This model was capable of switching from passenger to cargo carrying in a very quick time as the QC stood for Quick Change. The passenger cabin seating was modular and was capable of being removed. This allowed for carrying passengers during the day and then switching to cargo carrying at night. There was an ATR 42-400, however, only 5 were built. This model was simply an ATR-320 with the same PW-121 engines but with a six-bladed propeller. The ATR 42-500 was a much more modernised aircraft overall. The first one was delivered in October 1995 and featured improvements in the passenger cabin as well as performance. The engines were the more powerful PW-127Es which drove six-bladed propellers. These more modern propellors resulted in a quieter passenger cabin, whilst the extra power gave the 500 a better takeoff weight, better performance on hot and high airfields as well as extra range. Twelve years later in October 2007, ATR launched the ATR 42-600. The 600 boasted improved engine performance in the shape of the PW-127M. This delivered a 5% increase in performance over the PW-127M. The 600 was largely similar to the ATR 42-500 with minor improvements including an updated glass cockpit as well as the aforementioned engine upgrade. The maiden flight took place on 04 March 2010 with the first customer delivery made to Precision Air or Tanzania in November 2012. Demand was solid for the 600 and ATR increased its manufacturing base to around 4 times the size of the 2005 plant. There was talk of developing a short take-off and landing version, however, shareholders were less than excited with the idea. As the ATR 42 was taking to the air for the first time, plans were already underway to create a larger model. The ATR 72 was designed to cater for 78 passengers and was essentially a stretched ATR 42. An ATR 72-212A of Etihad Regional. This picture gives a good impression of how the undercarriage is attached to the main fuselage centre section, unlike aircraft like the DHC Dash 8 where it is housed in the engine nacelles. are assembled on the same assembly line as their components and systems are generally the same. In this way, they complement each other as demand may rise and fall for either model. 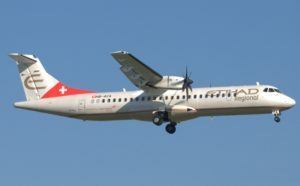 The launch of the ATR 72 project began on 15 January 1986 with the first airframe taking its maiden flight on 27 October 1988. On 25 September 1989, the French Directorate General for Civil Aviation granted type certification, with launch customer Finnair putting their first ATR 72 into service on 27 October 1989. There have been 5 main variants of the ATR-72 with differences mainly around engines, door configuration and performance. These difference can be seen in our spec table below. The current version is the ATR-600 which features an all-glass cockpit with wide screens, an improvement on the old EFIS system. As well, in the passenger cabin, the seats are lighter and the luggage bins have a greater capacity. This variant has also been approved for a high-density configuration of up to 78 seats. The ATR order book is still looking healthy with projected orders set to keep the production line running for some time yet. The company had started investigating a 90 seat version of the type, however, there seemed very little interest by either Airbus or the Leonardo to pursue this and it has reportedly been shut down. Engines SHP = Shaft House Power, PW = Pratt and Whitney Canada. 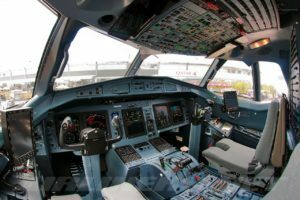 An ATR-72-600 (ATR-72-212A) of Royal Air Maroc Express Flight Deck. Note the modern LCD screens that replace the traditional EFIS systems. Whilst markets have been up and down, in 2017 ATR hade a resurgence of orders that will ensure the type will be n production for some time to come yet. The ATR-72 has been the more popular choice with airlines, at more than double the orders of the ATR42 even though it began production later. At the time of writing in mid-2018, the order numbers stood at 449 ATR-42s and 1,044 ATR-72s. If you like our page please be sure to share us on the social media links as well as visiting our other aircraft and blogs in the top menu.